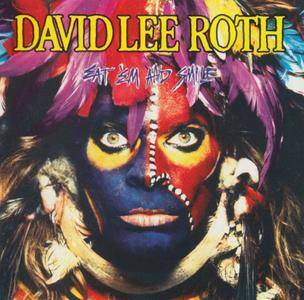 Few would argue that David Lee Roth's first solo EP was a complete comedy send-up, albeit a very successful one that gained him enough favor with the MTV peanut gallery to solidify his potential as a solo artist. 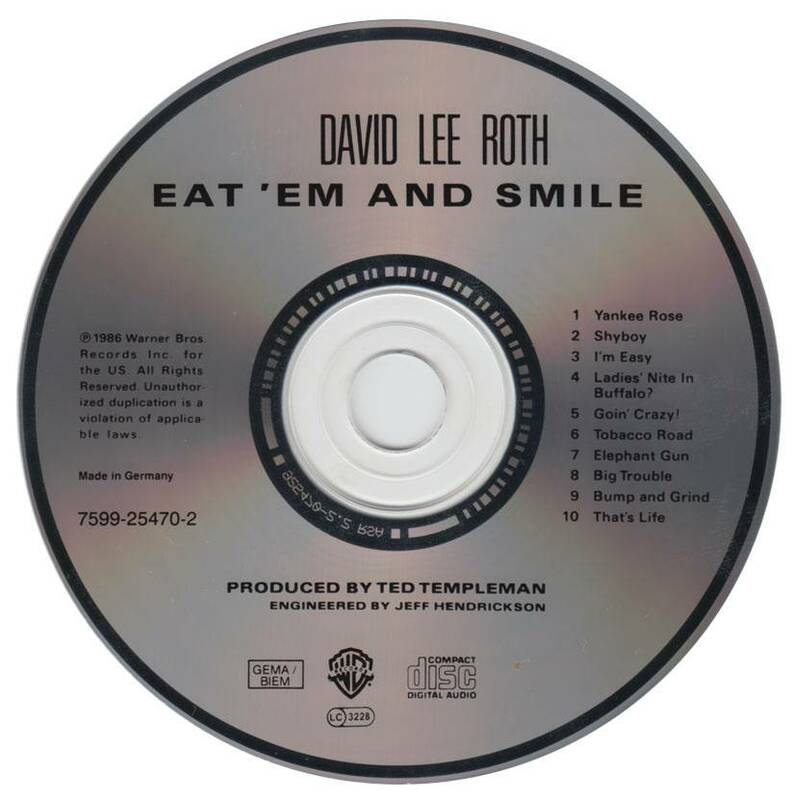 When threat became fact, however, Roth was smart enough to know that show tunes set to flashy videos weren't going to cut it and wisely proceeded to surround himself with musicians of impeccable pedigree. Thus armed, the "diamond" one set out to out-Van Halen Van Halen with his band's first effort, Eat 'Em and Smile, a more than adequate substitute for the overtly commercial tendencies of the "new and improved" original. Why mess with a winning recipe, indeed. Guitarist Steve Vai, bassist Billy Sheehan, and drummer Gregg Bissonette sound perfectly at home aping their boss' old cronies on such sizzling party anthems as "Shyboy" and "Elephant Gun." A fun-loving cover of "Tobacco Road" kicks off a very solid side two featuring the remarkably Fair Warning-esque "Big Trouble," and it doesn't get any better than first single, "Yankee Rose," where the squealing call and response between Roth and Vai reaches unparalleled comical heights. 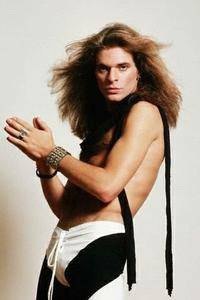 The glossy pump of "Goin' Crazy!" (originally conceived as the title track for Roth's botched movie project) hints at the pop excesses to come, and although two lounge pieces are knocked out for good measure, these are easily offset by the cool strut of "Ladies Nite in Buffalo?," arguably Roth's most legitimate piece of art ever. 4. Ladies' Nite In Buffalo? DR16 0.00 dB -18.63 dB 4:09 04-Ladies' Nite In Buffalo? DR13 -2.24 dB -16.98 dB 3:10 05-Goin' Crazy!